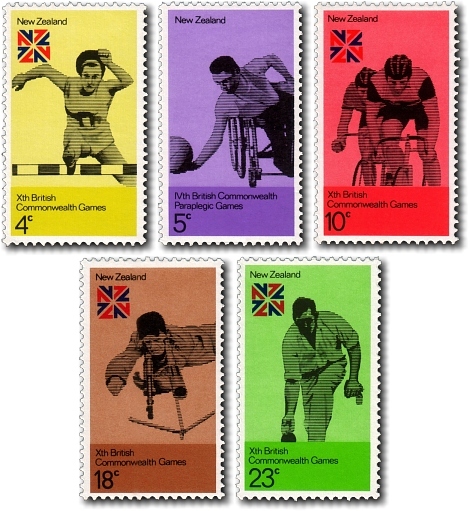 This issue commemorates the 10th British Commonwealth Games held in Christchurch with the exception of the 5 cent stamp which commemorates the 4th Paraplegic Games held in Dunedin in 1974. The Commonwealth Games were held from January 24 to February 2. Following the massacre of Israeli athletes at the 1972 Munich Olympics, the Commonwealth Games in Christchurch was the first multi-sport event that placed the safety of participants and spectators above all else. Security guards surrounded the athleteâ€™s village - which are now halls of residence on the University of Canterbury campus - and there was an exceptionally high-profile police presence. Despite the precautions, the games went without hitch and were called "the friendly games". Nine sports were featured with 1,276 athletes competing in athletics, badminton, boxing, cycling, lawn bowls, shooting, swimming and diving, weightlifting and wrestling.